Since ancient times, the human drive to create and listen to music has spanned cultures. Despite the fact that music is not considered an adaptive behaviour nor a second order conditioned stimulus many people consider it to be a significant part of their life. Music is a unique stimulus in that it activates almost every cognitive system in the brain . After music is transduced by the ear and processed by the auditory cortex, signals are sent to multiple areas in the brain, such as the hippocampus and frontal lobe systems which are important for memory, the amygdala which is important for emotion, the cerebellar systems for motor control, and many more . However, listening to music is not simply a passive activity, it can actually change the brain. Studies of early music exposure in developing children, and from the clinical use of music as a treatment for patients with neurodegenerative diseases, brain trauma, or affective mood disorders for example are widely known . Furthering the study of music and the brain may be able to provide insights into a wide range of motor, sensory and cognitive functions, the spectrum of musical capabilities, and non-invasive therapeutic applications. Absolute Pitch has been frequently reported in people with autism. It has been frequently reported in people with sensory and developmental disabilities, including Autism Spectrum Disorder (ASD), Williams syndrome, and congenital blindness, that they possess absolute pitch (AP), the ability to identify the absolute frequency of a pitch without any external sources of reference. AP has been found to be prevalent especially among those with ASD, with the likelihood as high as 5%. Researchers have tried to look for the correlations between AP and ASD by investigating the neuroanatomical and cognitive aspects. One of the key topics has been the atypical asymmetry of planum temporale (PT) that might be behind the link between AP possessors and developmental disabilities, but more work on the underlying correlations needs to be done in the future. 1. Dohn, A., Garza-Villarreal, E.A., Heaton, P., Vuust, P. Do musicians with perfect pitch have more autism traits than musicians without perfect pitch? An empirical study. PLoS ONE. 7(5): e37961. doi:10.1371/journal.pone.0037961 (2012). 2. Brown, W.A. et al. Autism-related language, personality, and cognition in people with Absolute Pitch: results of a preliminary study. Journal of Autism and Developmental Disorders. 33(2), 163-167 (2003). The power music has to elicit emotional responses has spanned human history and cultures. Indeed the emotional nature of music may be its most defining feature . It is the most common reason people cite when asked why they listen to music  (Figure 1), and even young children have an innate ability to accurately describe the intended emotional content in musical pieces . However the mechanisms behind the surprisingly strong emotions that music can elicit have been a mystery. A mystery that many philosophers and scientists from Aristotle to Darwin have speculated about . Because music does not have an obviously biological or adaptive role it is unclear what elements would be responsible for the strong and seemingly universal effects it has on the brain, the body and behaviour . Some philosophers have said that it must simply be an "auditory cheescake" - an accident of evolution . However, with recent advances in neural imaging it has been possible to show that music can indeed activate the areas of the brain that are known to be involved in emotions, rewards and core adaptive drives: the limbic, paralimbic and mesolimbic regions . It is therefore starting to become clear how the different elements and structures in music combine to activate these ancient areas in the brain and cause the strong emotional and physiological responses that almost everyone is familiar with. Bobby McFerrin demonstrates how well people intrinsically understand the hemitonic pentatonic scale. Alzheimer’s disease (AD) is a neurodegenerative disorder that affects millions worldwide and is characterized by a progressive decline in cognitive functions, including the distinctive hallmark of deterioration of memory. Although the medial temporal lobes are a primary targeted brain area in this disease , it has been found that in even moderate to severe Alzheimer’s musical semantic and procedural memory, which are thought to involve the left temporal gyri, are often preserved . 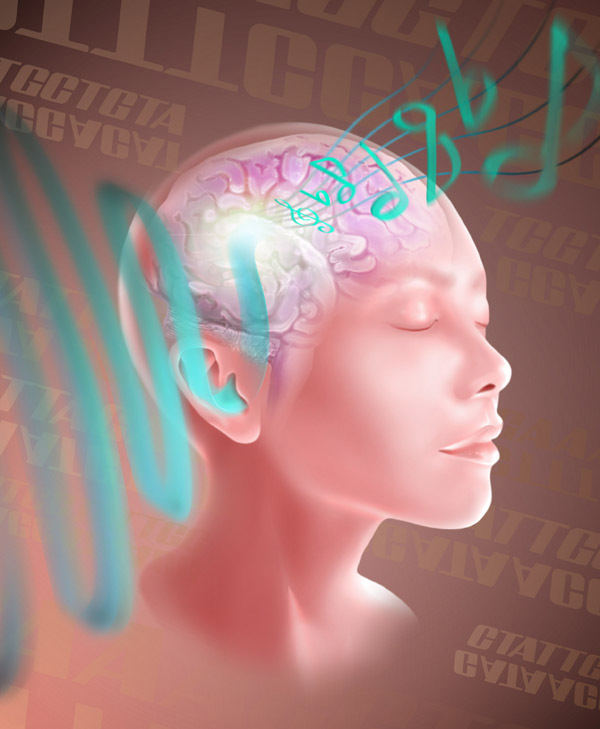 This inexplicable conservation of musical memory, coupled with the relatively poor tactics of treatments currently offered, make this wide-spread and impactful disorder a possible candidate for novel therapeutic strategies. Music therapy seems to be a promising alternative, offered in a variety of forms, providing a low cost and low risk approach for the possible prevention and treatment of Alzheimer’s, while perhaps also providing insight into the neural correlates of musical memory. 1. Cuddy, L.L., Duffin, J.M., & Gill, S.S. (2011) Memory for melodies and lyrics in Alzheimer’s disease. Music Perception, 29(5), 479–491. 2. Wilson, S.J., & Saling, M.M. (2008). Contributions of the right and left mesial temporal lobes to music memory: evidence from melodic learning difficulties. Music Perception: An Interdisciplinary Journal, 25(4), 303-314. 3. Baird, A., & Samson, S. (2009). 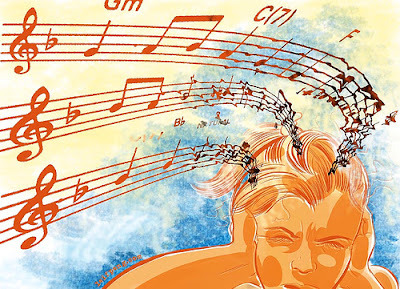 Memory for music in Alzheimer’s disease: unforgettable? Neuropsychology Review, 19, 85-101. The benefits of music use on mood disorders, such as depression and anxiety, have long been studied across many experiments due to the effects it can have on cognitive, sensorimotor, and emotional processing . Recent experiments that study the effects of music in those with pre-existing disorders show that in fact, music can improve the quality of lives of those with pre-existing depression by decreasing levels of depression and anxiety . Studies conducted on those with other pre-existing neurological diseases such as Parkinson Disease also reflect an improvement in overall quality of life when physical rehabilitation is combined with music therapy . Research on music therapy is therefore currently a relevant field study, as it can open up a field of non-invasive, non-medicinal form of therapy . 2. Koelsch, Stefan. (2009). “A Neuroscientific Perspective on Music Therapy”. New York Academy of Sciences. 1169: 374 – 384. 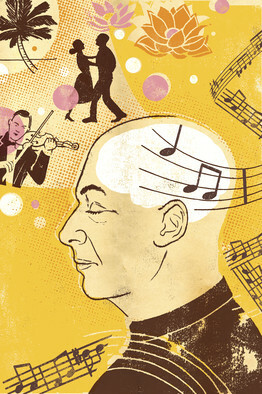 Music, both in its passive and active form, is known to be a stimulus for inducing brain plasticity. Whereas passively taking in music focuses mainly on the auditory cortex, actively production of music (ie. musical training) is much more complex and involves the development of higher-order motor and cognitive regions  . Although the molecular mechanism of brain plasticity has been understood as a balance between LTP and LTD events, recent endeavors focus on identifying areas undergoing plasticity as a result of musical training. 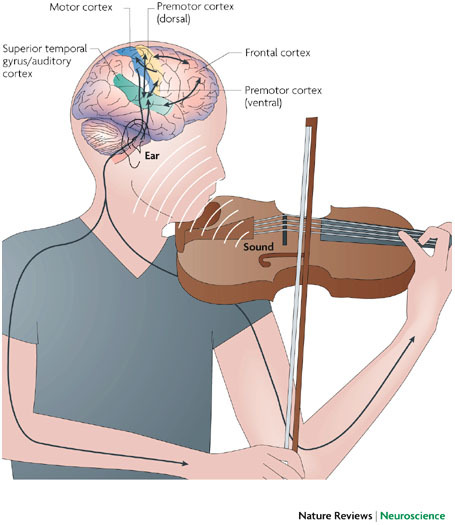 The wide variety of musical instruments allows for the development of many specific brain regions, despite this, there are overlapping areas which are altered. These areas are considered the main structural changes and the degree to which they change reflects in our behavioral outputs over various domains. The field of music and the brain is rapidly evolving as it is a novel example of experience-dependent plasticity to explore how much of our development is caused by nurture as opposed to nature (genetics) . 1. Herholz, S., & Zatorre, R. (2012). Musical training as a framework for brain plasticity: Behavior, function, and structure. Neuron, 76(1), 486-502. 2. Wan, C., & Schlaug, G. (2010). Music making as a tool for promoting brain plasticity across the life span. The Neuroscientist, 16(5), 566-577.
:: Wengenroth M, Blatow M, Heinecke A, Reinhardt J, Stippich C, Hofmann E, Schneider P.(2013) “Increased Volume and Function of Right Auditory Cortex as a Marker for Absolute Pitch” Cereb Cortex, 2013 Jan 9 :: Keenan JP, Thangaraj V, Halpern AR, Schlaug G. (2001) “Absolute pitch and planum temporale” Neuroimage, 2001 Dec, 14(6): 1402-8 :: Schneider P, Scherg M, Dosch HG, Specht HJ, Gutschalk A, Rupp A (2002) “Morphology of Heschl’s gyrus reflects enhanced activation in the auditory cortex of musicians” Natural Neuroscience 5, 688-694 :: Schneider P, Sluming V, Robert N, Scherg M, Goebel R, Specht HJ, Dosch HG, Bleeck S, Stippich C, Rupp A (2005) “ Structural and functional asymmetry of lateral Heschl’s gyrus reflects pitch perception preference” Natural Neuroscience 8, 1241-1247 :: Dorsaint-Pierre R, Penhune VB, Watkins KE, Neelin P, Lerch JP, Bouffard M, Zatorre RJ (2006) " Asymmetries of the planum temporale and Heschl's Gyrus: relationship to language lateralization" Brain 129, 1164-11767 :: Bossomaier T, Snyder A, (2004) Absolute pitch accessible to everyone by turning off part of the brain?” Organised Sound 9 (2): 181-189 :; Pinker S (1994). “ The Language Instinct” Penguin Press. Language is one major aspect that interacts with the human brain daily. It provides itself as a cognitive function to humans. Without language processing, humans would lose a sense of communication and understanding with each other. Language is composed of different levels of syntax, tones, and acoustic parameters. Thus, it is important to understand how the brain perceives language, where it is processed and how to enhance it. Strictly speaking, language processing today has been stated to involve brain regions such as the Broca’s and Wernicke’s area. On the other hand, current research has suggested that music is one effective way to enhance certain language processing such as speech production. Music is much like language where it involves parameters such as intensity, pitch and frequency placed on each note. Moreover, music processing has similar brain region localization to those of language processing. In other words, the activation of brain regions when exposed to music may function to help when it comes to language processing. Therefore, it is crucial to underlie how music expertise may help to enhance language processing such as speech production using a comparative approach with music. 1. M. Besson, J. Chobert, C. Marie. “Language and Music in the Musician Brain”. (2011): 617-634. WEB. 15 September 2011. The perception of musical rhythm is extremely complex, involving a lot more than just the auditory cortex. Using neuroimaging techniques and behavioural testing, researcher have begun to examine many facets of rhythm processing, including the neural correlates involved in rhythm perception, the developmentally- and culturally-driven changes in rhythm perception, and the limitations and errors that can occur during rhythmic processing. Using functional neuroimaging, the main brain regions correlated to rhythm perception are the cerebellum, the olivary nuclei of the pons, the prefrontal and parietal cortices. Behavioural studies done in infants show that the ability to perceive rhythmic patterns appears extremely early, but babies show fundamental differences in the cognitive strategies employed during musical rhythm processing[2,3]. The early emergence of rhythm perception in infants fuels the controversial question of whether musical rhythm perception is an evolutionary trait (e.g. a byproduct of a more critical process, like the circadian clock or linguistic rhythmicity) or just a neural fluke. Much of the scientific evidence suggests that musical rhythm processing is indeed a part of a much bigger and crucial process, namely language processing and generation. Thus, the perception of rhythm is not limited to being merely a component of musicality, which enables you to be able to enjoy music, but the inability to perceive rhythm may spell consequences in the linguistic domains as well. 1. Tramo, M.J. (2001). Biology and music. Music of the hemispheres. Science, 291, 54–56. 2. Philips-Silver, J. & Trainor, L.J. (2005). Feeling the beat: Movement influences infant rhythm perception. Science, 308, 1430. 3. Hannon, E.E., Soley, G., & Levine, R.S. (2011). Constraints on infants’ musical rhythm perception: effects of interval ratio complexity and enculturation. Dev Sci, 14, 865-872. 4. Zentner, M. & Eerola, T. (2010). Rhythmic engagement with music in infancy. PNAS 107(13), 5768-5773. As the debilitating effects of stroke are becoming more cause for concern, therapists have been looking for an effective method through which stroke patients can be rehabilitated. Strokes occur as a result of an interruption of blood flow in the brain, leading to a sudden decrease of brain function. They can be classified into two main categories, hemorrhagic and ischemic . In an ischemic stroke, blood flow is halted or disrupted to certain brain areas due to numerous reasons, such as a clot or obstruction in the arteries. The lack of blood to these areas starves the neurons of oxygen, glucose, and other vital metabolites that are necessary in order for them to function. A hemorrhagic stroke is caused when a blood vessel (such as an aneurysm) bursts and causes blood to accumulate in the brain and cause intracranial pressure(click here for a video module). Depending on where the rupture occurs, a patient with hemorrhagic stroke can present with specific symptoms . Strokes that affect the left cerebral hemisphere can impact speech function and motor and sensory deficits for the right side of the body, while strokes in the right hemisphere can cause hemineglect (on the left side of the body) and depth perception. Strokes are not limited to the cerebral hemispheres, however, such that strokes in the cerebellum affect motor coordination and strokes in the brainstem affect basic functions . Due to the widespread damaging effects, rehabilitation is often an extensive, gruelling process for a stroke patient. Professionals from various disciplines often collaborate to help return a patient as much as possible to normal life. Stroke victims may undergo any or all of the three common types of therapy: physical therapy, in which certain exercises and procedures allow a patient to recover lost physical function ; occupational therapy, which allows patients to re-learn and develop the skills that are essential to maintain daily living and social interactions ; speech-language pathology therapy which re-trains patients that have lost communication and/or swallowing skills as a result of the stroke . Music was used informally while treating the veterans after the first and second World Wars; it has since then become an increasingly recognized form of therapy. While the “healing” properties of music have been discussed for centuries, it was only with the advent of brain imaging techniques that the scientific community began to take interest in this field . As more research is being conducted to explore the effectiveness of music therapy, a more diverse and proactive therapeutic program can be used to help rehabilitate stroke victims. 1. Powers, W.J. (1990). Stroke. In A.L. Pearlman & R.C. Collins (Eds. ), Neurobiology of disease (pp. 339-355). New York, NY: Oxford. 2. Donnan, G.A., Fisher, M., Macleod, M., Davis, S.M. (2008). Stroke. Lancet, 371, 1612-1623. 7. Thaut, M.H. (2010). Neurologic music therapy in cognitive rehabilitation. Music Perception, 27(4), 281-285. 2. Loui, P., Alsop, D., Schalug, G. “Tone Deafness: A New Disconnection Syndrome?” The Journal of Neuroscience 29.33 (2009): 10215-20. 20 Jan. 2013. I think your topic was really cool and innovative and interesting. This was one of my favourite ones to read!